Mother’s Day is coming! This year, Mother’s Day is Sunday, May 8th – a little more than three weeks away. That makes now the perfect time to do some Mother’s Day Gift Shopping! What Makes A Great Mother’s Day Gift? Let’s be real: shopping for Mom can be hard. There’s no way to really say “Thanks!” for all the things that Moms do when they raise us – from encouraging us to get right back in the saddle after we ‘misjudged’ our balance to standing ring side for hours, waiting to smile and clap when we finally had our turn in the ring. Expressing appreciation for all the comfort, encouragement, and even those sterner moments when we were told it was *past time* to start mucking stalls is hard: nothing ever seems to say it all. You can do a pretty good job, though, if you understand what makes a great Mother’s Day gift. A great Mother’s Day gift is something that your Mom likely would never buy for herself, that makes her smile and gasp with delight – and that she can’t wait to show all of her friends. 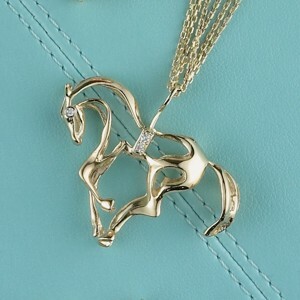 We’re really loving this 14K Yellow Gold Prancing Horse Pendant for Mother’s Day. Check out the diamond eye and surcingle – you can never go wrong with diamonds! The shine and sparkle of this piece is absolutely fashion forward, and the playful design combines elegance and fun…just like Mom! If your Mom is a horsewoman, too, you might want to think about a piece from our Rider Ring Collection. These rings are designed to be worn all of the time – and can stand up to the wear and tear of life around horses. Gold rings are a favorite Mother’s Day gift. Horse jewelry can be great as a Mother’s Day gift as it signifies meaningful time the two of you spent together. Sparkle and shine is great, but sentiment is better. Deliver all three, and this Mother’s Day, you just might leave Mom speechless. Can you advise if you have this beautiful horse pendant in silver and if you deliver to the uk or south africa?